David Steinberg was born in 1942 and grew up in Winnipeg, Canada. At the age of 16, he left home to study theology at yeshiva. At the University of Chicago, after seeing a performance of The Second City, David was inspired to start a comedy act called Kadish and Steinberg. When some Second City members saw David’s act, he was invited to join the company. He stayed for four years. In the late 60’s he moved on to Broadway, starring with Elliot Gould in Jules Feiffer’s Little Murders and Carry Me Back to Morningside Heights, directed by Sidney Poitier. From there he moved to stand up comedy opening at the Bitter End in 1969. He received a rave review from the The New York Times, calling him a cross between Lenny Bruce and Woody Allen. After his first appearance on the “The Tonight Show”, David became one of Johnny Carson’s most popular guests and guest hosts, with 140 appearances—second only to Bob Hope. 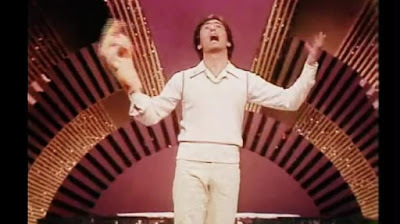 In the early ’70s David capped a prolific stand up carreer with four comedy albums, two Grammy nominations, and a successful nightclub act at the Bitter End. Here's a typical stand-up comedy routine that Steinberg performed in 1975. Enjoy! I always enjoyed Steinberg's humor. Then, all of a sudden, he disappeared. Thanks for bringing him back for an encore.